Is there a way to transform only selected nodes within a shape? I can select nodes, but I can't figure out how to scale, rotate, or skew them, though I can apply those functions to the entire shape. In Photoshop (for example) I can select any number of nodes within a given shape, then hit Command-T to enter Free Transformation mode. From then on, any transforms will apply only to the nodes I had selected. Sounds like a good suggestion. I will move it to the feature suggestion forum. 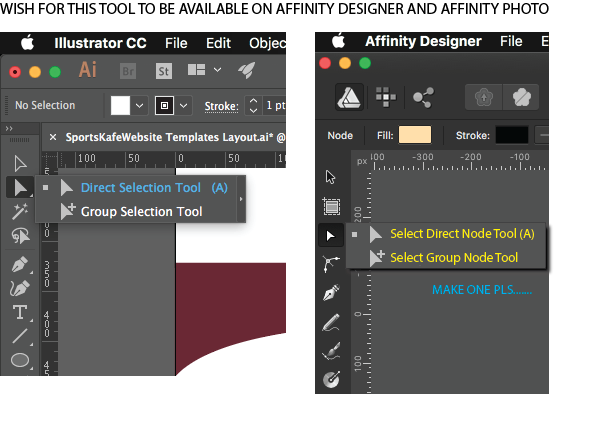 After using Affinity Designer for an hour, this is the feature I miss most! +1 for feature request. Oh yes. Was looking how to do this myself. Would be very, very helpful. +1 request as well. I'd like to see selected nodes that are scaleable, rotatable AND can use the alignment tools. Also, the ability to set the center point that the nodes translate about. This was a great feature within Freehand - which I AFAIK illy doesn't have - would tie in well with affinities great focus on node level productivity and power. +1. Pretty critical for editing vectors. +1 I agree scaling groups of nodes is an important feature, also when handling things in symmetry. This is the most used feature while editing existing vectors. Same problem here. Please, add this feature asap. Thanks. +1 Would love to see it working within Affinity Photo mesh deform too. It's already the best of all mesh deforms available in image soft but lucks that feature badly. +1. First feature I miss in Designer. +1 I really need to do me than just move the points, scaling would be first for me. AD is pretty impressive already but switching from AI (for me) still requires a huge effort on the free transformations. I really like AD & AP & I'm using them more & more but they still need a lot more work. For quick fast web graphics I'm a Fireworks fan & still use it as my go-to app, but as adobe wreaked that along with other great software I would like to move to something new like AD. The people here seem cool & I like their philosophy. Thats aslo what I am looking for, similar on what i am asking about the node. And also for the AD and AP. Check out my post about: Using NODE TOOLS as for DIRECT SELECTION TOOLS of ILLLY is buggy or what? ?